I Love this bag! with Fendi's famous "FF" Logos all over in a updated shape, with inverted pleats at center, it's a perfect example of uptown chic meets everyday pratical needs of every stylish women! Iconic ZUCCA print canvas, Chain top handles with woven leather with Enameled Zucca clasp and the Inverted pleat details on center front. 11"H x 18"W x 5"D Made in Italy. Click on photo to see more details. 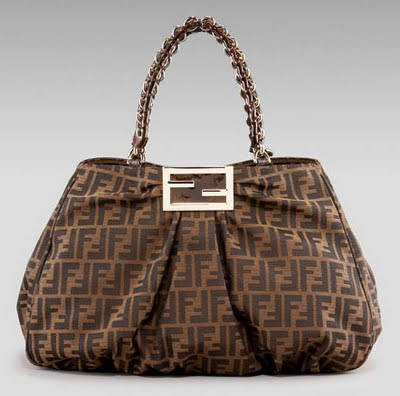 Chck out this bag at Fendi flagship stores or NeimanMarcus.com ! it's a fabulous bag!